The Nintendo Entertainment System: NES Classic Edition (released in Europe as Nintendo Classic Mini: Nintendo Entertainment System) is a miniature recreation of the original Nintendo Entertainment System, released on November 11, 2016 in the U.S. and Europe. For Japan, Nintendo would later announce the Nintendo Classic Mini: Family Computer, a Family Computer equivalent to this iteration of the system. In April 2017, a Nintendo of America representative reported that the Nintendo Entertainment System: NES Classic Edition was being discontinued, and that final shipments would be sent out to retailers throughout the month. Soon after, the same news would be confirmed for the Australian market, after retailers in the region had confirmed that they would not be receiving more stock, and even later Nintendo would confirm the news in Europe. Nintendo would later state the NES Classic Edition was only meant to be a holiday product, with demand prompting them to produce further shipments Nintendo of America president Reggie Fils-Aimé would also suggest that the system was cancelled to focus on other products going into the future. In September 2017, Nintendo announced that the NES Classic Edition would be brought back with new shipments beginning in summer 2018. The system was later announced to be in stock starting on June 29, and both it and the Super NES Classic Edition are expected to remain in stock through 2018. The NES Classics Edition is a miniature "plug and play" Model No. NES-001 Nintendo Entertainment System which can play a set of built-in NES games. The system cannot play NES Game Paks, however, only the installed titles. The system outputs a high-definition video signal through HDMI, and uses a USB-based AC Adapter (note that an adapter does not come with the European version of the console) that connects to the console through a micro USB port. Like the original, the system features two controller ports, which are the same model as the Wii Remote's expansion port. The system comes with an NES Classic Controller, based on the original controller, but any other model of the Classic Controller can also be used. Turning on the console, the player is taken to the main menu, where they are able to choose one of the thirty games to play out of a list. By pressing Select on the controller, the player is able to sort the games list in various orders, including alphabetically, in original release order, by publisher, by most recently played, the number of times played, and by 2-player games. Finally, if the player remains idle for long enough, the system will enter into "Demo" mode, in which the player is given a tour of the 30 games on the system. Each of the games has multiple suspend points, allowing the player to stop playing and resume from where they left off. Pressing the Reset button on the console during play returns the player to the main menu, where they are able to save their current progress as a restore point and start a different game. Each title has four suspend points each. Suspend points can also be "locked" by pressing down on the controller when hovering over one, preventing that restore point from being saved over. The player is also able to choose from three different display settings: a simulated CRT display mode, the normal 4:3 mode, and a "pixel perfect" setting. In addition to this, the player is also able to access suspend points by pressing down and the menu on the top of the screen. Among these features is the ability to change display settings, a general "Settings" menu that allows the player to enable or disable demo mode, screen burn-in reduction, and auto-shutdown, the "Legal Notices" menu, and an option to change the system's language display. Also available is the manuals, which, instead of displaying the manual on the television, instead displays a QR code, allowing the player to scan it and view digital scans of the original game manuals on a different device. As a standalone device, the NES Classic Edition can only play the included games. NES Game Paks are not supported, and additional games cannot be purchased or transferred onto the system. Console viewed from the front. The NES Classic Edition as seen alongside the original Nintendo Entertainment System. ↑ 1.0 1.1 NES Classic - A Close-Up Look at Every Angle (Slideshow). GameXplain (YouTube, August 23, 2016). Retrieved August 23, 2016. ↑ "The NES is coming back to stores! Pick up the new mini NES Classic Edition on 11/11 w/ 30 included games!" Nintendo of America on Twitter (July 14, 2016). Retrieved July 14, 2016. ↑ 3.0 3.1 3.2 3.3 3.4 Nintendo Entertainment System Nintendo Entertainment System: NES Classic Edition Coming This November, Ships With 30 Games. Nintendo Life (July 14, 2016). Retrieved July 14, 2016. ↑ "Nintendo Classic Mini: Nintendo Entertainment System arrives on 10/11 in AU/NZ w/ 30 games included (SRP AU$99.95)!" Nintendo AU/NZ on Twitter (July 14, 2016). Retrieved July 14, 2016. ↑ 5.0 5.1 5.2 Nintendo Discontinues the NES Classic Edition. IGN (April 13, 2017). Retrieved April 13, 2017. ↑ 6.0 6.1 Report: That’s it for the Nintendo Classic NES Mini in Australia (Update: Confirmed). Vooks (April 14, 2017). Retrieved April 14, 2017. ↑ 7.0 7.1 Nintendo discontinues NES Mini in Europe, too. Eurogamer (April 18, 2017). Retrieved April 18, 2017. ↑ December 2016 NPD: NES Classic Edition sells 223,000 units in the U.S. Nintendo Everything (January 20, 2017). Retrieved January 20, 2017. 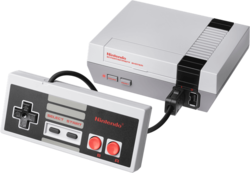 ↑ 9.0 9.1 Nintendo is releasing a miniature NES with 30 built-in games. The Verge (July 14, 2016). Retrieved July 14, 2016. ↑ Nintendo Classic Mini: Famicom announced for Japan. Nintendo Everything (September 29, 2016). Retrieved September 29, 2016. ↑ 11.0 11.1 Nintendo Has Sold 2.3 Million NES Classic Systems. Time (April 28, 2017). Retrieved April 28, 2017. ↑ Nintendo increases inventory of Super NES Classic Edition; NES Classic Edition returns to stores in 2018. Nintendo (September 12, 2017). Retrieved September 12, 2017. ↑ "#NESClassic Edition will return to stores on June 29! This system and the #SNESClassic Edition system are expected to be available through the end of the year." Nintendo of America on Twitter (May 13, 2018). Retrieved May 13, 2018. ↑ Nintendo UK on Twitter (May 14, 2018). Retrieved May 15, 2018. ↑ Nintendo AU NZ on Twitter (May 13, 2018). Retrieved May 15, 2018. ↑ Nintendo's Classic Mini is a tiny NES with 30 games. Eurogamer (July 14, 2016). Retrieved July 14, 2016. ↑ 17.0 17.1 Relive past glories with Nintendo's ultimate retro gaming experience. Nintendo (July 14, 2016). Retrieved July 14, 2016. ↑ 18.0 18.1 Nintendo Entertainment System: NES Classic Edition Features Trailer. Nintendo (YouTube; September 30, 2016). Retrieved September 30, 2016. ↑ 19.0 19.1 19.2 19.3 NES Classic Edition - Hands-On Preview (UI Revealed, Options, & More!) GameXplain (YouTube; September 30, 2016). Retrieved September 30, 2016. ↑ Nintendo on the NES Classic Edition – audience, different display modes, and more. Nintendo Everything (August 7, 2016). Retrieved August 7, 2016. ↑ "With the NES Classic Edition, you can play 30 classic NES games using three display modes: CRT filter, 4:3 and Pixel Perfect." Nintendo of America on Twitter (September 30, 2016). Retrieved September 30, 2016. ↑ New NES Classic Edition Details Include Display Modes, Game Manuals. GameSpot (September 30, 2016). Retrieved September 30, 2016. ↑ A look at the hardware behind the NES Classic Edition. Nintendo Everything (November 3, 2016). Retrieved November 3, 2016. ↑ Nintendo NES Classic Cannot Download Virtual Console Games. IGN (July 14, 2016). Retrieved July 29, 2016. This page was last edited on 16 May 2018, at 01:13.